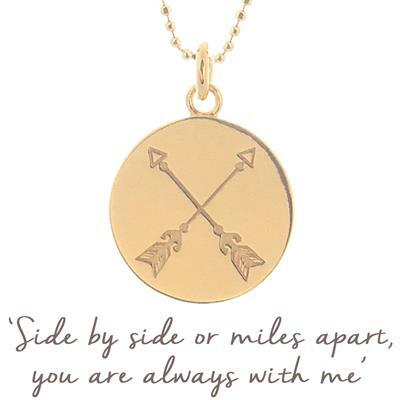 Choose our new Mantra disc showing two crossed arrows as a gift for your best friend. A traditional symbol of friendship, the arrows crossing represent how lucky and blessed you and your friend feel, that your paths crossed. With the heart-warming mantra, 'Side by side or miles apart, you are always with me', this makes a lovely gift for a friend. Blank on the reverse, many friends buy a necklace each, having the name of their friend engraved on their own pendant, and vice versa. Made from gold plated 925 sterling silver.